George Washington distilled corn and rye whiskey and operated a water-powered grist mill near Mount Vernon, where he ground flour and cornmeal. A reconstruction of George Washington's whiskey distillery and grist mill is open to the public and features guided tours led by historical interpreters who explain how the mill and the distillery work and the role they played in Washington's farming operation. George Washington's Whiskey Distillery and Gristmill is located three miles from the Mount Vernon Estate and Gardens and requires separate admission. George Washington was the only founding father to commercially operate a whiskey distillery, and its size and volume of production rank the building among the most important historic structures of its kind. 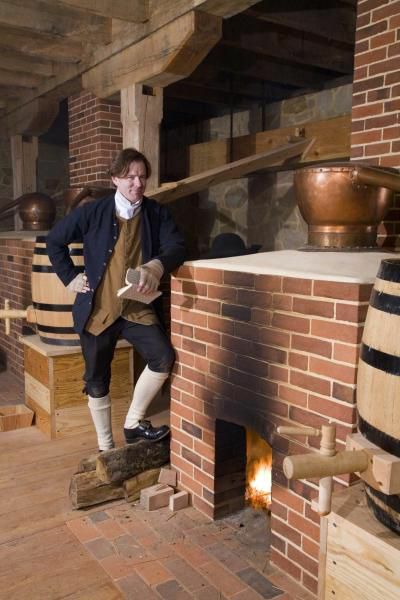 The distillery was a very successful economic component of Mount Vernon. At its peak production period in 1799, five stills and a boiler produced 11,000 gallons of whiskey valued at $7,500. Costumed distillers operate five massive copper stills, stirring mash tubs, and managing the boiler as they demonstrate 18th-century distilling. The two-story building also features a storage cellar with barrels, an office, and two bedrooms where the site manager and assistant would have lived. On the second floor, a History Channel video called "George Washington's Liquid Gold" and a museum exhibit, "Spirits of Independence: George Washington and the Beginnings of the American Whiskey Industry," tell the story of whiskey at Mount Vernon and its history in America. At the Gristmill, costumed millers operate four floors of machinery to show how Washington's complex farming operation expanded to include a commercial grist mill which produced flour that was exported around the world. The Gristmill is located three miles from the Estate's Main Gate on Route 235 South. Public transportation is available between the Estate and the Gristmill. The Fairfax Connector Bus #152 stops in front of the Mount Vernon Inn at 42 past the hour every hour. The Fairfax Connector Bus #151 returns to the Estate on the hour every hour between 10 a.m. and 5 p.m.
Tickets to the Gristmill are available at Mount Vernon's Main Gate or at the Gristmill Shop and may be combined with admission to the estate for an additional $2 for adults and $1.50 for children ages 6-11. Admission to the Gristmill only is $4 for adults and $2 for children. Where is Cleveland's Whiskey Island?